RobotWar is a programming game developed for the PLATO computer system at Indiana University in the 1970s by Silas Warner. In 1980 RobotWar was ported to the Apple II and published by MUSE Software. The aim of the game is to write a program to control the movement, radar and gun of a battle robot. The original PLATO game placed two robots in a battle arena with the survivor being declared winner. 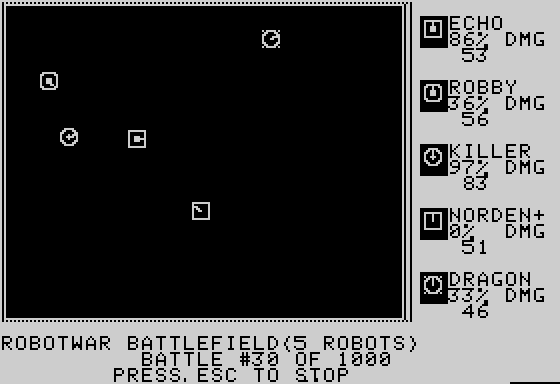 The Apple II release supported up to five robots in the arena. Robots battle in a 260×260 metre arena (x- and y-coordinates are in the range 0..256). The DAMAGE register starts at 100 and drops every time the robot is attacked or collides with something. A robot is destroyed when DAMAGE reaches 0. The complete specification is available in the RobotWar manual. The RobotWar manual has a step by step guide to the language of robots. The Key Summary and Programming Instructions contains a brief description of the controls and language. Speeding Up Your Robot by Richard Fowell is a tutorial on instruction timings and optimising for speed. RobotWar Gun and Radar Behavior by Richard Fowell examines the finer details of robot warfare. 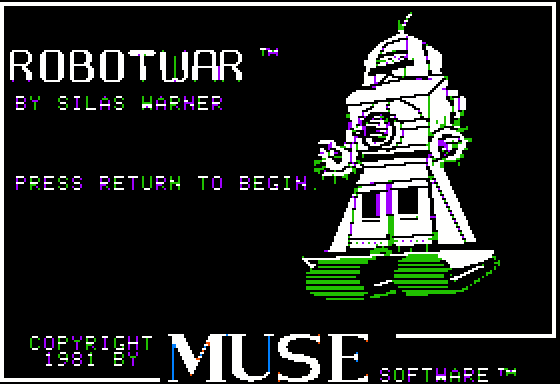 RobotWar was published on a 5.25″ disk for the Apple II / II+, priced $39.95. Early versions restricted the INDEX register so it could only access registers A–Z. Later versions allow INDEX to access all registers. rwdc.c is a decompiler to recover a robot program's source code from its object code. A Windows binary is available. 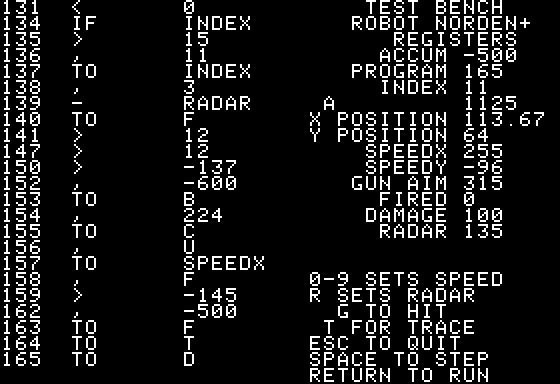 Bottom, Mover, Random, Scanner and Target (included on the RobotWar disk). Hector II by Larry Farrell and Mark Hougaard (published in Interface Age, Nov 1981). Bottom Killer, George and Test by Bill Edmunds (published in Computer Gaming World, Nov–Dec 1981). Norden+ by Richard Fowell (published in Computer Gaming World, Mar–Apr 1982). Dragon by Doug Hogg (published in Computer Gaming World, Mar–Apr 1983). The First Computer Gaming World RobotWar Tournament was held in 1982. Norden+ claimed first prize for Richard A. Fowell, who won the RobotWar trophy and a RobotWar t-shirt. In 1983 CGW held their second RobotWar Tournament. 12 robots entered, with Dragon by Doug Hogg taking first place. Second place went to Corner by David A. Jones, with Hot Rod and Norden B tied for third. A disk of the entries was available for $10. The Third Annual CGW RobotWar Tournament received 17 entries. Dragon4A by Doug Hogg and Mustang by Stanley Chen shared first place, winning their creators $50 and a RobotWar trophy. A disk containing the entries was available for $15. 12 robots entered the Fourth Annual CGW RobotWar Tournament in 1985. Newman Lowe claimed first place with his robot Nobody, winning the RobotWar trophy. Frank Krogh formed the Postal RobotWar Club in July 1982 to sponsor tournaments for players unable to attend the Burbank / UCLA RobotWar meetings. Robots were awarded the titles master, champion and grand champion as they progressed through the levels. The club also offered a lightweight tournament for robots under 150 instructions and a team tournament. Taylor Rollo, Mary. "Robot War: Strategy for Learning." Softtalk 1.5 (Jan 1981): 18–20. Voskuil, Jon. "Robotwar." SoftSide 4.12 (Sep 1981): 92–93. Lubar, David. "Robotwar." Creative Computing 7.10 (Oct 1981): 68–69. O'Connor, Patrick and Leah. "Game Corner: Robotwar." Interface Age 6.11 (Nov 1981): 24, 156. White, Harry. "Robot War." The Space Gamer 45 (Nov 1981): 4. Edmunds, William. "Robotwar: A Wargame for All Programmers." Computer Gaming World 1.1 (Nov–Dec 1981): 13–16,33. "Computer Gaming World's Robotwar Tournament." Computer Gaming World 1.1 (Nov–Dec 1981): 17. Feigel, Curtis. "Robotwar." BYTE 6.12 (Dec 1981): 24–34. Fowell, Richard. "Norden+, Robot Killer." Computer Gaming World 2.2 (Mar–Apr 1982): 25–26. Duvivier, Jean-François. "RobotWar." Pom's 4 (Jui 1982): 48. Hunter, David. "Olympic Metals: The RobotWar Tournaments." Softline 1.6 (Jul 1982): 28–30. "Announcing The Second Annual Robotwar Tournament." Computer Gaming World 2.5 (Sep–Oct 1982): 21. "Robotwar: Tournament Results." Computer Gaming World 3.2 (Mar–Apr 1983): 30–31. "Third Annual CGW Robotwar Tournament." Computer Gaming World 3.6 (Dec 1983): 12. "We Have a Draw! Robotwar Tournament Results." Computer Gaming World 4.2 (Apr 1984): 36. Sandys, Jeff. "RobotWar — Review and Challenge." Call — A.P.P.L.E. 7.9 (Sep 1984): 45. "4th Annual Robotwar Tournament." Computer Gaming World 5.1 (Jan 1985): 9. "Nobody Wins 4th Annual CGW Robotwar Tournament." Computer Gaming World 5.3 (Jun–Jul 1985): 9.